Nestled deep in the Deschutes National Forest, Odell Lake in Oregon is one of several pristine alpine lakes found in the beautiful Cascade mountain range. Quick access to skiing, snowmobiling, fishing, hiking, and more from this perfect 4-bdr/3bath vacation home in Crescent Lake, OR (Diamond Peaks development off Hwy 58). Odell Lake lies deep in the beautiful Deschutes National Forest several miles southwest of Bend. Record-breaking lake trout have been caught in this lake. Sailing, windsurfing, fishing, and wildlife viewing are popular activities. The spectacular Diamond Peak Wilderness Area is adjacent to the southwestern edge of the lake. Not far from Willamette Pass lies Odell Lake, a sparkling alpine lake in central Oregon southwest of Bend. Surrounded by mountain hemlock, noble fir, and lodgepole pine, the crystal blue waters of Odell Lake cover nearly 3,600 acres. With over 13 miles of scenic shoreline, Odell Lake is a popular spot for hiking, wildlife viewing, fishing, sailing, windsurfing, and camping. Adjacent to the southwestern edge of the lake is the spectacular Diamond Peak Wilderness Area, which covers over 52,000 acres. Odell Lake, OR is located southwest of Bend, take Hwy 97 south for about 56 miles, then head west on Hwy 58 - the lake is about 19 miles ahead. Odell Lake is open from the latter part of April to the end of October. Deschutes National Forest, 1001 SW Emkay Drive, Bend, OR, 97702. Phone: 541-383-5300. Visit the website here. 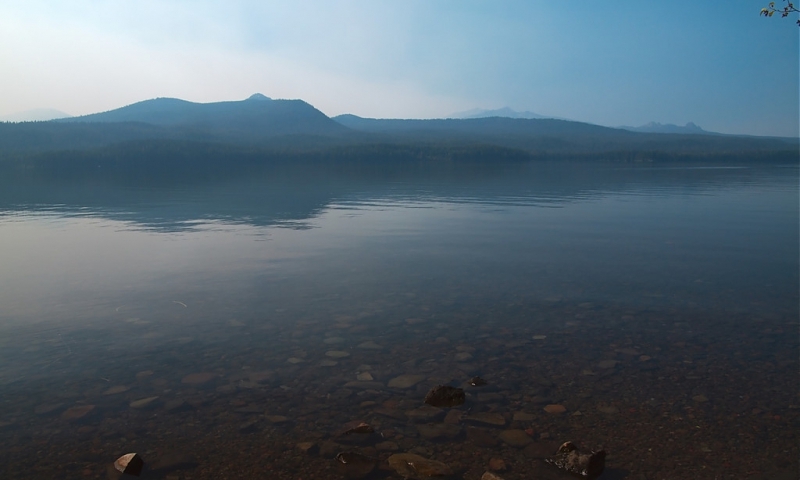 Fishing – Anglers enjoy the remote serenity of Odell Lake, Oregon. The lake offers Kokanee salmon, lake trout, mountain whitefish, and rainbow trout. Sailing and Windsurfing – Winds on this beautiful lake make it a popular spot for sailing and windsurfing dring the warm summer months. Skiing – The nearby Willamette Pass Ski Area, with over 550 acres and 430 inches of fresh powder each year, offers excellent downhill skiing in the winter. Wildlife viewing – The area surrounding the lake has an abundance of wildlife including majestic elk, black-tailed deer, mule deer, foxes, bears, snowshoe rabbits, pine martens, and marmots. In 1984 a record-breaking lake trout was caught at Odell Lake, weighing in at 40 pounds, 8 ounces. Odell Lake is one of the larger Cascade lakes. It is 6 miles long and 1.5 miles across at its widest point. The maximum depth of the lake is 282 feet. The Pacific Crest Trail passes right by the northwest end of the lake.